My entire life I have been a nail biter, I do it in times of stress, sadness, happiness, and excitement. I am an all around nail biter, but it’s such a terrible habit/need, and I’ve felt embarrassed by my hands my whole life. So this year I made a promise to myself that I would stop biting my nails, and I have successfully achieved this goal! 1. Figure out why you’re doing it and try to find something to fill that desire, for me I chew on rubber hoses for my Insivalign, so I started to use those in stressful/overwhelming situations. 2. Keep your nails painted. This not only makes your nails look cute, but your less likely to bite them when they are painted. If you find your still biting them, add no bite to the top of your polish, it tastes terrible. 3. Start with one hand. Allow yourself to only bite the nails on one hand, after two weeks change it to 2 nails on that hand. Then after two weeks switch to one nail and then none. By doing it over several two week intervals it makes it easier to stop. If you still have trouble with it, get acrylic nails put on, leave them on for 2-3 months. You may find your nails are weak, and have ridges on them, I used a multivitamin and VidaGlow to strengthen mine and the ridges fade over time. Now my only struggle is I am actually terrible at painting my nails, as you can see in the above picture lol. 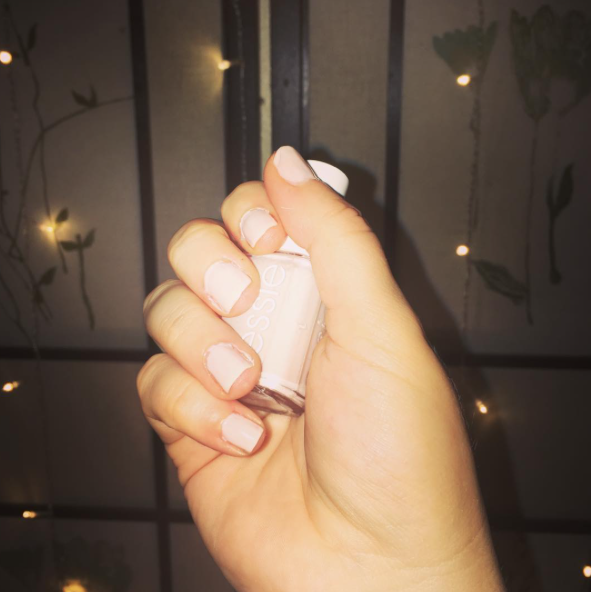 If you have any tips or tricks please leave them in the comments for others that are struggling with nail biting.